Back in Secondary School, I was in the Interact Club; a co-curricular club devoted to community service. Moving on to Junior College, I joined canoeing but somehow our team landed up in Laos doing community work in our December holidays. I thought National Service was in itself already community service, but apparently this wasn’t enough and in my cadet days, I found myself in an Old Folks Corner making preparations for Lantern Festival. Turning 21 and enrolling into University, more community work ensued with the minimum 80-hours of CIP policy that is imposed by the University before one is allowed to graduate…I have always asked myself why does the Singapore system place so much emphasis on CIP? xoxo…I will be back on 19th Dec 2010 (Tues)! Proudly born and bred as a Hokkien, Beng Thin Hoon Kee Restaurant (which serves Hokkien Cuisine) has always had a special place in my heart. I used to dine here occasionally in the past, never failing to order their mesmerizing Oyster Omelette on every trip. Sadly, it has been some time since my last visit but seeing Beng Thin again today was akin to seeing an old friend, evoking feelings of familiarity and comfort. 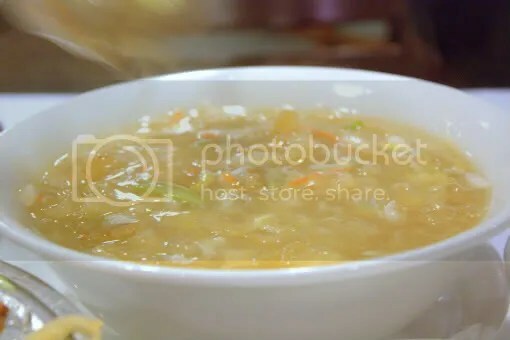 A well established Hokkien restaurant, Beng Thin is patronized typically by the older generation, as well as a popular choice for business lunches. Set lunches are available and I ordered a set for 3 pax at $78++. 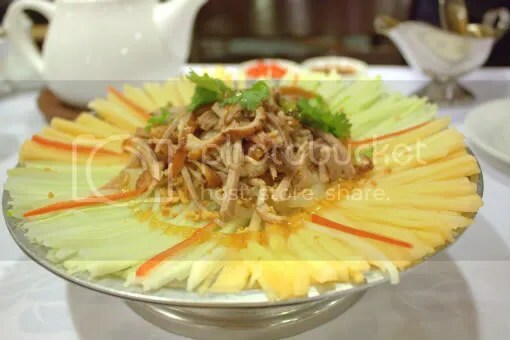 The Beng Thin Duck Salad was a delightful appetizer. Tender duck and springy jellyfish mixed with Melon and Honey. A good balance of sweet and savoury. The Crabmeat Fishmaw Soup was for want of a better word, so-so. I didn’t really like the Fried Crayfish in Hot Sauce. 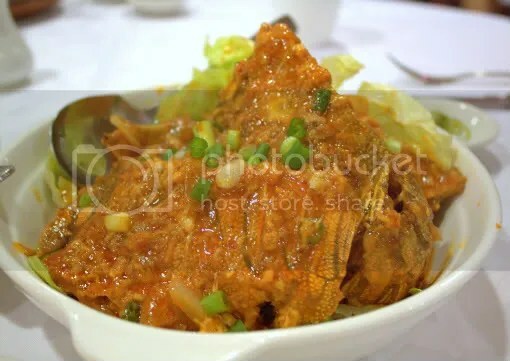 The Crayfish was overcooked and slightly on the tough side, and the hot sauce felt like a weaker sibling to a typical chili crab sauce. 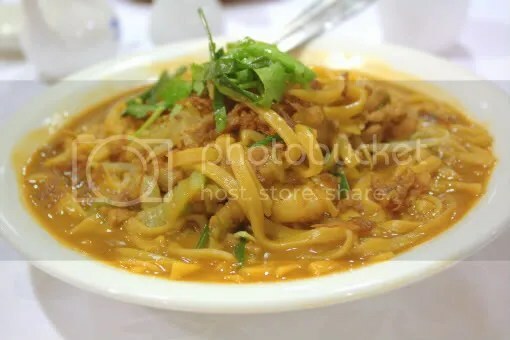 Though the Fujian Fried Noodles is one of Beng Thin’s Specialities, I wasn’t very taken by it either. Differing from the hawker Hokkien Mee in that the noodles are thicker and that there is a lot more gravy, I would say that the Fried Noodles ain’t bad but wasn’t mind-blowing. 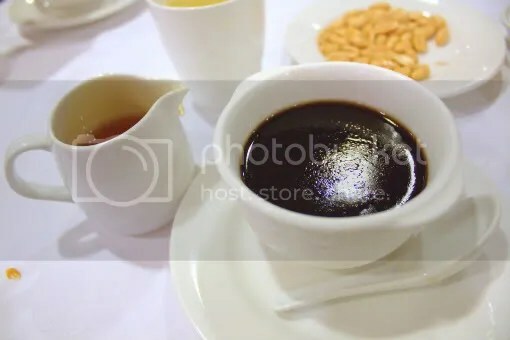 Dessert was a simple Herbal Jelly. Portions for the 3 pax set meal are large enough to serve 4 so I was throughly stuffed by the end of the meal. However, I elicited far more satisfying experiences on my previous visits so I felt a bit let down today. My word of advice is to skip the set meals and just order ala carte. Remember to try out the Oyster Omelette (I promise it will rock your world), Braised Pork Belly with Buns and Fried Cod with Spices.